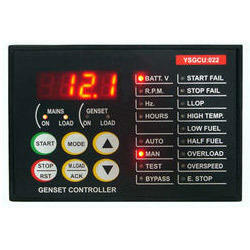 YSGCU022 Genset Control Unit is a high performance A.M.F. Controller for diesel Generators. This is specifically designed to suit the low cost AMF Control Panels. It has 6 powerful operating mode. It features 4 digit 7 segment LED display, 21 LEDs and 6 keys for manual operations and settings. It is supplied with 9 channel Relay card and connecting cables. Established in the year 1995, at Pune (Maharashtra, India), we, “Yugandhar Systems”, are renowned as one of the distinguished Manufacturer, Exporter and Supplier of an extensive array of Load Sharing Controller, Genset Controller, Smart Label Dispenser, Smart Micro Stepping Driver, Smart Standalone Driver, Smart Tailor System, Smart Label Dispenser, Smart Micro Stepping Driver, Smart Standalone Driver, etc. Our complete product range is fabricated by our skilled team of professionals in compliance with the set international quality standards using the finest grade components and sophisticated technology. The advanced machines installed at our infrastructure are used in the manufacturing process of our product range and enable us to bring forth precision engineered products. The products offered by us are highly appreciated by our reputed clients for their elevated durability, longer service life, dimensional accuracy, optimum finish and robust construction. These products are available in various sizes, designs and dimensions as per the variegated requirements of our prestigious clients.